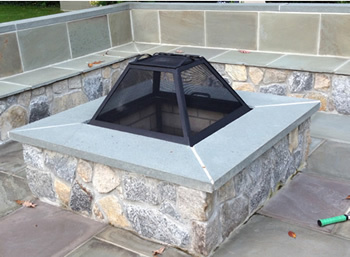 This is a fire pit safety screen in a square configuration. These are a little pricey but you definitely getting what your paying for. 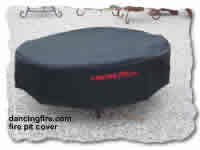 This is our version of a fire pit safety screen to fit square or rectangle fire pits. This is basically a pyramid with the point cut off. This screen is basically a work of art. Hand made by a skilled fabricator. These are very labor intense because of all the angles and straight lines. If one weld is off a 1/16' by the time you get to the finish that 1/16 has no grown to the point you have junk. When you weld steel it gets hot. When steel gets hot it warps and the warpage changes all the angles so you have to be slow and articulate every step. We can produce five round screens in the same time it takes to make one square screen and my fabricators are skilled americans. The features on our square screens that sets us apart is it has a door on one side and the top comes off. The reason for the top coming off is for cooking smores and such without getting marsh mellow guts every where and the fire is still safe. These screens are very heavy duty and can take the heat without warping. 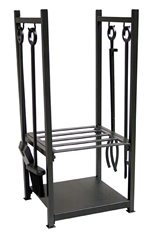 The steel frame is not just one piece of steel with the mesh welded to it. The SS screen material expands a lot when it get hot and contracts when it cools off. The issue with that is if the mesh is welded to the frame and the SS mesh expands it stresses the weld joints and will fail with time. What we do is we sandwich the SS mesh between two pieces of steel. You have the original steel frame and then we lay the mesh on the frame and then weld another piece of steel to the otter steel frame. The mesh is not welded so it has room to expand and contract. The second piece of steel frame that's welded to the otter frame also adds a tremendous amount of strength to the frame because not the frame can warp or bend, it's basically laminated. 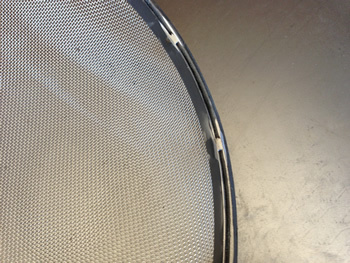 We use nothing but stainless Steel mesh material. If any one is offering any fire pit safety screen in anything other the stainless steel walk away. Common sence dictates that it's outside and over a fire. Use only stainless steel because anything less will fail and rather quickly so why save a little in production cost to deliver an inferior product? If your spending X amount on a product and for a little more money you could get 10 times the quality product you won't mind spending an extra few bucks to do it right? I would any day. The base of the frame is 2" material not anything less. If your frame fails then you trash the screen so why cheap out here and go with anything less. The cost of 2" steel vs. 1" (That everyone else uses ) is very minimal so why go cheap here? The mesh screen is supported at every corner. The mesh is always flat and framed. No curved mesh corners. We take great pride in our work. This style screen can be made in any size but we also make a square one piece screen that might work better on smaller size screens less the 30" x 30". You can see the one piece screens here. The deluxe screens are made with a substantial amount of steel and this could be overwhelming for smaller screens but we will be more then happy to accommodate you if this is what you desire.